Leonard Bernstein was an artist of great substance and staggering range. His deep insight into the classical repertoire and the dazzling diversity of his own music makes him a unique – and uniquely important – figure in 20th-century cultural history. 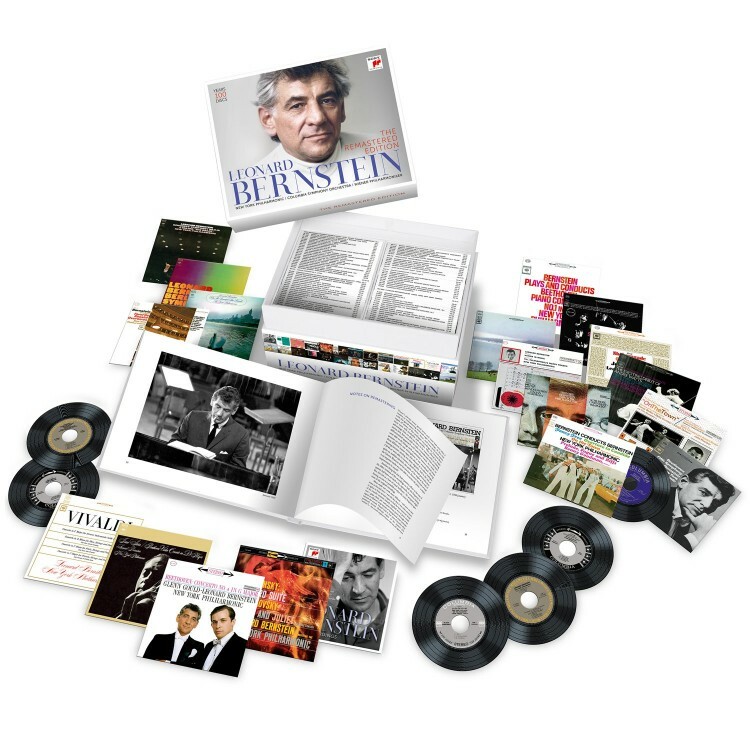 As his centenary year approaches in 2018, the range of Bernstein’s accomplishments as a conductor, composer, pianist and educator is celebrated by Sony Classical in a 100-CD set that will become a catalogue landmark. Leonard Bernstein: Afterthought - Study for the Ballet "Facsimile"
Festival Overture in E-Flat Major, Op. 49 "1812 Overture"
IV. Sehr langsam. Misterioso. "O Mensch! Gib Acht!" V. Lustig im Tempo und keck im Ausdruck. "Es sungen drei Engel"
Recitativo: "C'en est donc fait !" Lento cantabile - "Ah ! qu'ils sont loin ces jours"
Recitativo: "Au comble des revers"
Méditation. Largo misterioso - "Grands Pharaons"
Allegro assai agitato - "Non !... non, de vos demeures"
Allegro non troppo - Recitativo misurato: "Dieux du Nil"
IIIb. Final Chorus: "Alles Vergängliche"
Symphony No. 82 in C Major, Hob. I: 82 "The Bear"
Symphony No. 83 in G Minor, Hob. I:83 "La Poule"
IV. Urlicht. Sehr feierlich, aber schlicht. "O Röschen rot!" V. Im Tempo des Scherzos. Wild herausfahrend. "Auferstehn, ja auferstehn wirst du" - "O glaube, mein Herz, o glaube"
Symphony No. 6 in A Minor "Tragic"